After 24 years, the Taizé community has returned to Prague for the 37th European meeting. The logistical challenges were enormous, but the most powerful experience probably lay in the ordinary meetings between very different people, reflecting a universal fellowship. Here you will find some echoes from the meeting, testimonies written by the young participants. Since September, an international team has been working in Prague, at "Kafka House" in the historic city centre. During the month of December, this team was steadily reinforced by thirty young people who arrived early before the actual meeting began. 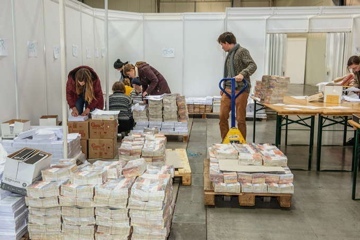 On December 27, 2000 volunteers arrived to help with the final preparations, including large groups of young peope from Poland, Ukraine, Germany, France, and of course the Czech Republic itself and neighbouring Slovakia. They were all geared up for welcoming the other participants, and organising the transport, meal distribution, places of worship, taking deliveries of tons of food items, including 105,000 mandarins and many other jobs. Most of them arrived after a long coach journey. They were first welcomed at Letňany, at the city’s exhibition centre, then in various parishes throughout Prague. Brother Alois also personally thanked them during the first evening prayer. I spent the last two months living in Taizé as a volunteer, and most of our work was getting ready for the European meeting in Prague. Yesterday, my mission was to welcome the two thousand volunteers who came to help with the final preparations. I still wonder how we managed to welcome so many people, and what it will be like on the 29th with 21 000 more people! I’m a volunteer for the first time at a Taizé meeting. I’m in the transport team and despite the cold and the snow, I’m really enjoying the work! It’s good to take part in the meeting in a very practical way and it’s really nice to meet people from all over the place – in our team, but also the other pilgrims. To see their smiles when they arrive really made us happy! I come from Taiwan and I study in Germany thanks to a university exchange. This is the first time I’ve taken part in the Taizé European meeting. Everything here amazes me. Yesterday I was helping at the german-speaking welcome. It was a great experience even if we were a bit tired by the end. I’m constantly meeting new people ... and getting to practice my German. Although Prague is in the centre of Europe, coming to the European Meeting is still a long journey for many young people. For those from Northern Europe, Spain or Portugal, the bus journey sometimes took more than fifteen hours. Many began their journey the previous day and arrived late in the afternoon or evening. For the last few days, the regular bus lines between Gdansk and Prague have been full of young people coming for the meeting. While some of us are tired from the trip, we are full of energy to join in with the preparations, and willing to help newcomers who are even more tired than us. To house the 23,000 participants coming from outside, we had to convince many families and elderly people to open their doors to strangers. In a country that people say is very secularized, there was a real support from the civil authorities, as well as a show of solidarity shown by the large number of state school head-teachers who agreed to open halls and classrooms to house pilgrims. A member of the family hosting us unfortunately had to go to hospital. We were ready to go and sleep in a school, but the good news reached us in the afternoon: his health had improved. Despite this, the family wanted to welcome six people. We were even more touched by their solidarity after realising they had three small children at home, all very happy to share their space with young pilgrims from all over Europe. Two days ago, a Spanish friend told us about a family in Prague ready to welcome us during the meeting. Upon arrival, they received us with open arms and hearts. And they spoke our language. We are very grateful. After a long day in the cold Czech winter I appreciated the warm hospitality at our local Salesian parish community, dedicated especially to working with children. After walking in the dark and the wind, we were greeted by a friendly cup of tea and a very lively team. Well organized, they called our hosts, who came to take us home. 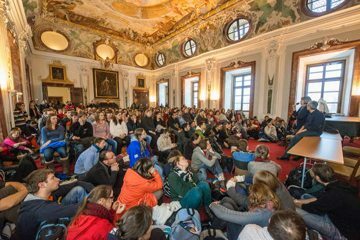 The young people called to be "salt for the earth"
On the occasion of the gathering in Prague Brother Alois published, along with echoes of recent visits to the American continent, four proposals for being "salt of the earth". He outlined the proposals in meditations each evening during the meeting. In reactions collected during the rally or in the comments on social networks, it was clear that the invitation to be "salt for the earth" echoed a sentiment shared by many young people. This is my dream: that this world can be a better place to live in. But what can I do to achieve this dream? I continue to ask myself, and to search for an answer. That’s why I come to take part in these meetings, to experience that indescribable feeling of joy and peace. My hosts told me that they were part of the ’Cladestine Church’ during the totalitarian regime. Small groups and communities of Christians continued to life their faith, despite the ban. For them it was also a way of resister against the regime. Listening to their story really made a mark on me and made me realize that we have a great responsibility as Christians. Not only to each other within our own communities, but also to society. To be salt of the earth, means supporting each other and bearing witness to our faith. By staying true to our values, I am sure we can bring about big changes and a little bit of peace in our society." Both for accommodation of the participants and the preparation of the morning program, congregations of all denominations were very involved in the meeting. Over 150 welcome points hosted morning prayers and small group sharing sessions. During the morning prayer, the song "In the Lord I’ll be ever thankful" was like a call to thanksgiving and trust in God. I decided not to leave my morale at zero, but to fully live the meeting like a pilgrimage. And did I make the most of it! In the church, we organised the prayer together and everyone took part. In my small sharing group we had a very deep talk about peace, in our hearts and in our societies. Two small groups visited a shelter for homeless people on Wednesday. The people living there enjoyed the songs that these international visitors sang for them in Czech. Two days later, we took them bread and food left over after the meeting and everyone was still very thankful for our visit and for these Czech songs. The exhibition centre at Letňany being quite fare from the city centre the choice was made this year only to hold the evening prayers and a single meal service there. 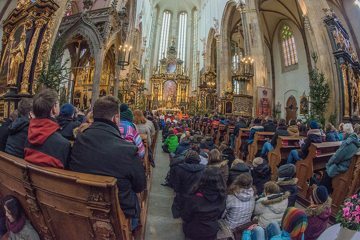 The midday prayers were held in 17 churches in the historic centre of Prague. What touched me most during this European Meeting were the beautiful moments of prayer together. It was a communion of music and prayer that touched my heart. What moved me most were the words of the song "God is Love. Dare to live for love." 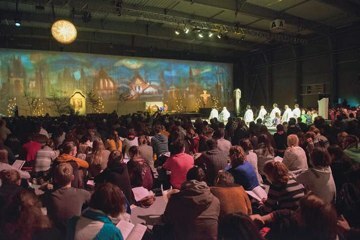 The afternoon workshops on the 30 and 31 December were built around four main themes: Faith and Spirituality, Church, Solidarity and Society, and Art and Culture. Some places proved too small, so great was the crowd wanted to hear the speakers, like Father Tomas Halik. We had a very interesting presentation on the history of icons and how biblical stories were represented in pictorial form. The speaker was the artist Martin Damian, who lives in Prague, and has endeavored to describe the long and interesting process of creating an icon. Finally what stays with you, from those days spent in Prague, is perhaps the conviction that the human family is more united than it often seems. In recent years I have been to Taizé several times, I have met so many good people and friends for life. It’s great to see most of them at the beginning of each year in a different European city, even if they live far away. The atmosphere in the city during the meeting was incredible: strangers helping each other or simply walk along having deep conversations with each other. I heard about Taizé from a friend of mine who belongs to the same church. She told a bit about it and offered to put me and some friends up during the meeting. Together we had an experience not only of being friends but of being a real family, sharing life experiences and praying together. During the times of prayer, the workshops and meals, I realized that I would not be able to always control the events that I face, but I am the salt for the world and keeper of that taste. Now and in the future, will I be bitter or better? Less seasoned or more flavoured? ... these are some of the questions that have come to mind during the times of sharing. Photograph Album by Jakub Kulaviak (Czech Repubic) If you have something to add to this list please write to media taize.fr. If you are taking part in the meeting in Prague and wish to contribute something written or an illustration for this page, contact echoes taize.fr.